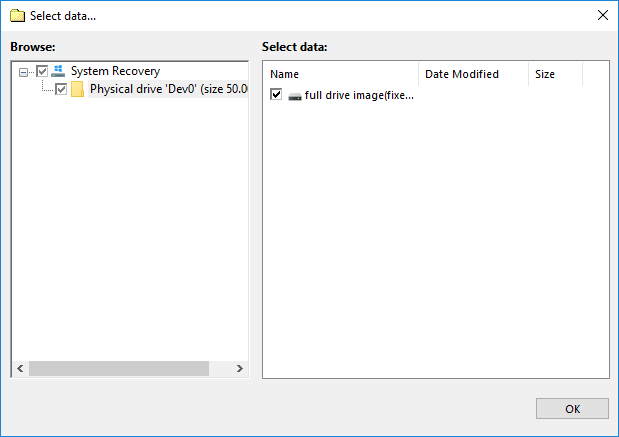 The System Recovery plug-in allows saving an image of a whole system as a VHD file. User can open this file later for browsing its content, use it as an image for a VirtualBox machine, or just restore it as a whole. It allows backing up a system from inside without stopping it. A user must have an administrative privileges on the system assigned to backup, to grant Handy Backup a full access to an entire system data. 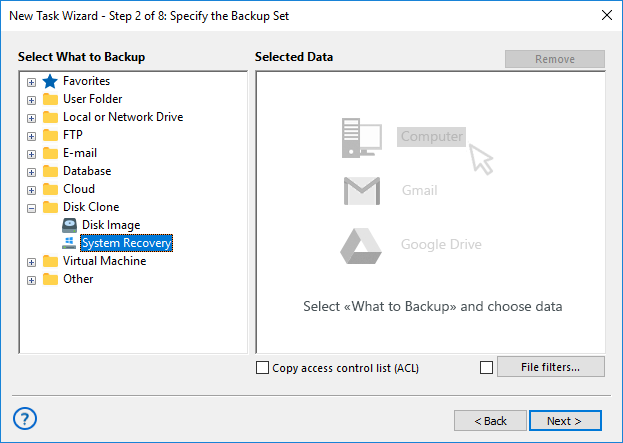 Open Handy Backup as an administrator and create a new backup task. On the Step 2, select a “System Recovery” data source on the left panel. You will see a new window called “Select data…” with the list of drives attached to your system. Select drive(s) you are planning to back up by marking checkboxes against these drives. Press “OK” to return to the data selection window. Continue to create your task as usual. Open Handy Backup and make a new restoration task. On the Step 2, select a file backup.hbi located in your backup folder. In the “Select Restore Location…” dialog, you can click OK to restore a file to an original place, or a “Change location” button to call for a destination-changing dialog. To restore a system from your VHD file to a different drive, this drive must have at least a storage capacity of an original drive, or more. Click OK to proceed a restoring task creation as usual. Browsing a file as a folder containing different data. Both of these methods are not parts of Handy Backup. Please see the next chapter about implementing these ways: Using a VHD Drive Image without Restoring It.